Sunday, August 18th is the premiere of Season 4 of The Great Food Truck Race on The Food Network. If you’re remotely interested in food trucks, you have got to set your DVRs to record this season. We’re all set to see all the new teams compete for the right to win their own food truck and start their new careers. Again, Tyler Florence hosts the show and gives the competitors challenges that would stump even experienced food truck owners. Check out this exciting and drama filled preview where Tyler Florence introduces Season 4 of The Great Food Truck Race! Redeem Your Food Truck Race Coupon! 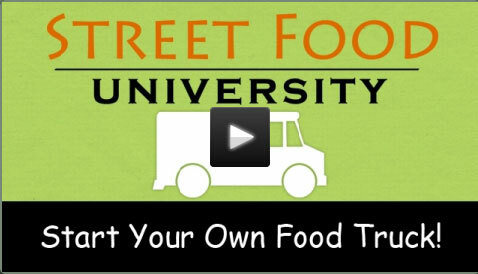 Before we introduce the names of the new food truck teams, we want to celebrate the exciting new premiere and season by offering a HUGE discount on our food truck video course called Start Your Own Food Truck – Leave the Corporate World Behind! The price will immediately drop to $35 and you’ll have access to over an hour of videos including the entire audio course to load onto your favorite MP3 player. But you need to take action soon because the coupon is good only for a limited time! Aloha Plate (Los Angeles, Maui and Oahu, Hawaii): Brothers Lanai and Adam, along with their friend Shawn, are making it their goal to bring the cuisine of Hawaii to the mainland. With classic dishes such as loco moco and poke, the guys think they will make island fans out of everyone who tries their food. Boardwalk Breakfast Empire (Sea Bright, N.J.): After losing her Jersey Shore restaurant of 37 years to the effects of Hurricane Sandy, Joanne is ready to get back to business and open her very first food truck with her two best friends by her side, Ilene and Tim, cooking up an over-the-top breakfast menu. Bowled and Beautiful (Los Angeles): Single moms Liza, Jessica and Heather find themselves at a fork in the road, ready to take on new challenges. They believe a food truck featuring fusion California cuisine served in a bowl will be the answer to making better lives for themselves and their kids. The Frankfoota Truck (New York): Mirlinda, Dana and Victoria are three best friends who have previously worked in restaurants, but they’re tired of taking orders from bosses. They want to open a food truck featuring their childhood favorite: hot dogs with a twist, such as unique toppings. Murphy’s Spud Truck (Los Angeles): After recovering from a health problem, Nicole decided to follow her dream and attend culinary school. With mom Suellen and brother James behind her, she wants to open an Irish-inspired food truck, featuring potatoes stuffed with all kinds of ingredients — there’s even a dessert potato. Philly’s Finest Sambonis (Philadelphia): After a car accident, former electrician Erik wants to follow his dream and cook with his best friends, Joe and Chris. The guys believe they have perfected the cheese steak and want to take their sandwiches, which they call sambonis, on the road. The Slide Show (Los Angeles): After closing his restaurant, which left him in deep debt, Chef Das turned to teaching culinary school and made it a mission to eventually get back into business. With the help of his chef friends Ahren and Maurice, he wants to open up a food truck offering unique sliders everyone will crave. Tikka Tikka Taco (St. Louis): Ready for a new path in life after the Army and working odd restaurant jobs, Shaun wants to go into business with his older brother Michael and their uncle Sam. Since food has always been at the center of their Indian family, a food truck offering Indian tacos seems to be the perfect idea. The trucks will start out in Hollywood, California and travel across the country to their final destination at the nation’s capitol building. They’ll be visiting a total of 7 cities that start in Los Angeles and then to Beverly Hills, San Francisco, Portland, Oregon, Pocatello, Idaho, Rapid City, S. D., Minneapolis/St. Paul, Chicago and finishing in Washington, D.C. The types of food and themes of the trucks are very diverse with something to offer for everyone. We’re excited to watch the premiere of Season 4 of The Great Food Truck Race!